Founded in 1996, this brilliant string ensemble is conducted by the renowned Italian Maestro Massimo Paris. It comprises 6 violins, 3 violas, 2 cellos, a double bass and a harpsichord. Concerto Málaga’s programme contrasts the Baroque Italianate lyricism and drive of Vivaldi with a selection of fin de siècle Spanish works by three composers who are connected through acquaintance and pedagogy and who helped establish a national style. Ian Wilson’s new piece was inspired by conversations with members of the Donegal Chamber Orchestra which reflect their passion for music and the orchestra itself. 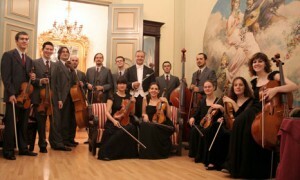 The DCO is directed by two members of Concerto Málaga. performed as viola and viola d’amore soloist at La Scala in Milan, the Carnegie and Avery Fisher halls in New York, Berlin’s Philharmonie, Concertgebouw Amsterdam, and the Sydney Opera House. He was a member of the Virtuosi di Roma and since 1978 has been viola soloist for the renowned ensemble I Musici. Massimo Paris plays a 17th-century Bohemian School viola d’amore.